Child custody battles are often the most difficult part of divorce proceedings. Property can be divided or sold, debts can be assigned to one party or the other, but how custody/visitation plans are structured is much more complex. As mothers and fathers contemplate divorce or (if not married to each other) paternity actions, they often find themselves with numerous questions. They want to know how things work legally, what their rights are regarding the children, and what rights the children have. After 23 years of practicing Family Law, I have worked with hundreds of divorcing parents and noted some concerns are universal. 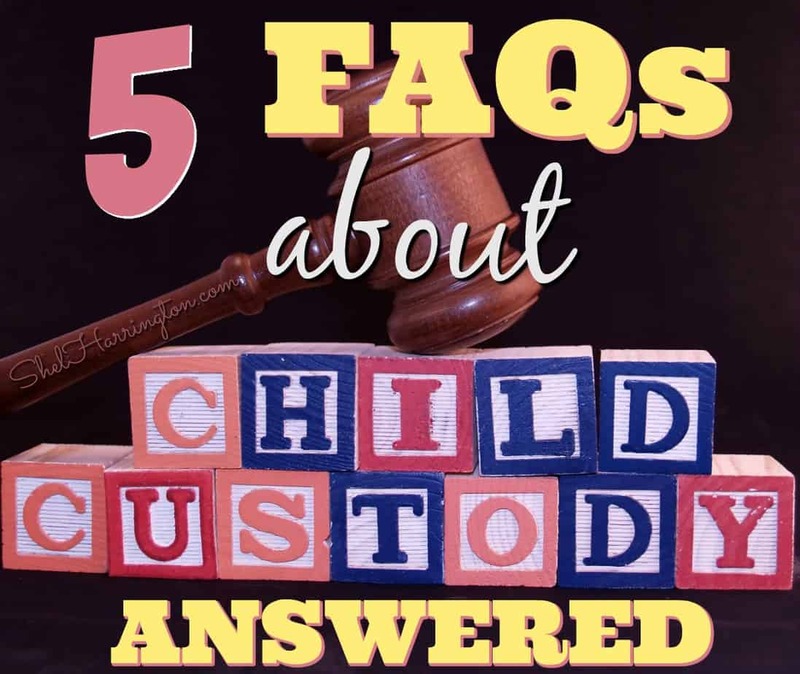 Here are 5 questions that most parents have about custody. At what age can a child decide which parent the child wants to live with? Hopefully no parent is actually asking a child to make the decision of which parent they would like to live with. That’s like asking them to pick which parent they like better – it’s a lousy position to put a child in even if they have a clear preference. Having said that, most states have an age where a child can express what their preference is, but ultimately the judge still makes the final decision. The judge is not bound by the child’s request if he or she does not feel that it is in the best interest of the child to place the child as requested. The judge will take into consideration the ability of each parent to care for the child, what the environment of each is, and the reasons the child has a preference. The older a child is, the more likely the judge is to honor the child’s request if it is not detrimental to the child to do so. While each state can make its own laws regarding custody and the age at which the court gives deference to a child’s preference, many states take the position that by the time a child is twelve years old they have the maturity to express a preference and their reasons for having a preference with regard to living with one parent or the other. Even states with a stated age usually have provisions in their laws which allow the judge to make a decision contrary to the child’s request if the child does not have the maturity to properly express a preference and/or if the request would not be in the child’s best interest. Are mothers more likely to be awarded custody than fathers? There was a time when the answer to this question would have been yes, but that is generally no longer the case. While there may be individual judges that have gender biases, most judges start with the premise that a child should have as much contact with both parents as is possible. While fathers are awarded custody more often than they once were, the general trend is toward co-parenting options. Whether it is called joint custody, co-parenting, shared parenting or another name, the intent is to ensure that the children have access to both parents and that both parents are allowed to actually parent versus being someone the children simply visit. If the parties are unable to cooperate, one parent has a history of addiction or abuse, or the parties are unable to communicate because of work or geographic hindrances, the judge will award custody to one parent and an appropriate visitation schedule to the other taking into account the specific circumstances. Will the judge split up siblings? Most judges try to protect children by keeping things as stable as possible in the midst of divorce and will not split up siblings casually. But custody is determined on a case-by-case and child-by-child basis. Some situations when a judge might consider splitting up siblings are (1) if children of a certain age request it, (2) if there is substantial/destructive conflicts between siblings, (3) the children have different needs that can best be met by a particular parent, and (4) other facts specific to the case that would result in it being in the best interest of the children to do so. Even if custody of the children is divided between the parents, visitation can still be synced in a way that the siblings are together on weekends, holidays and summer school breaks. Will the child have to testify in court? It is not likely. Judges have the discretion to speak with a child in their chambers if they want to receive information from the child and/or a child or parent has requested that the child’s input be received. Depending on the state, attorneys, the child’s Guardian Ad Litem,* or a court reporter may be allowed to be present while the child is being interviewed. The judge tries to balance the parents’ rights to due process with protecting the child from the pressure of testifying in front of parents and any repercussions that might result from testimony that displeased a parent. 5. Can a custody order be changed in the future? Yes. There are two ways a custody order can be changed. First, if a parent believes that the judge made a legal mistake with regard to the custodial decision made at trial, the ruling can be appealed if done so within the time frames set forth in the state law. Second, and more common, is if there is a change of circumstance since the original order that affects the best interest of the child. Typical changes that could warrant modifying the custody order include a problem arising with the custodial parent, a parent relocating, or a child getting older and expressing a preference. In either case, a Family Law attorney should be consulted to ensure that the parent understands what needs to be proved, what the legal procedure is, and the chances of being able to accomplish the desired modification. *A Guardian Ad Litem is a representative for the child who serves the dual role of representing the child's position and advocating for what's in the best interest of the child even if it conflicts with the child's preference. I think I’ve mentioned this before, Shel, you should compile all of these posts into a handbook. This is such beneficial information. An interesting concept, Jill! Happy almost-Friday! Hi where can I found more about Child Support. My father left when I was four. And I am 24 (married) now. Your best bet is to contact a local Family Law attorney, Tania – each state makes their own laws regarding child support and somebody in your area would be able to provide information to you about how it works where you are. You give such helpful, specific advice, Shel. I’m forwarding this on to two women in my writing class. Both are so lost and confused, and neither has anyone to trust. This will be very helpful and at least get them started. Thanks for passing it on, Marylin. Your fellow writers may be interested to know that many Family Law attorneys are willing to do free consultations to provide basic information about rights and procedures while navigating the tough waters of divorce and/or custody battles. Thanks Shel! All great points, but especially I thank you for #1. So many parents misunderstand, and tell their kids they get to choose at age 12 years. Then I get to be the bad guy when I tell them that is not the case. Very telling when a parent gets mad at me for that, and then runs off in search of a new person who might take sides. I feel so bad for kids in that awful place of having to choose a favorite. I agree with you, Gina – the “you get to choose when . . . ” phrase is used WAY to often and always incorrectly! I can only imagine how difficult it is for you to try and assist a child who has a parent more interested in “winning” than assisting. Good stuff, Prof! As a GAL, it is good to have these reminders! It is a tough job but I love working with the kids and helping them as much as I can! Thanks, Debbie! You’ve probably had more opportunities than you would like to explain the difference between “getting to choose” versus “expressing a preference.” Glad we have GALs like you out there to help children during divorce and custody battles! Shel your posts are on point and user friendly. I have worked with families who have separated siblings and it is like a second divorce that the kids are not mature enough to anticipate. I appreciate your wisdom- Thank you! I never thought about it in terms of being a “second divorce” for the children – those words have powerful impact and I’ll be sharing them with my clients and the parents of children I represent. Thanks, Lisa!